Hioki clamp on meters are best-in-class measuring devices incorporating Hioki’s expertise in current sensing technology. 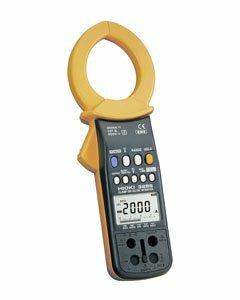 The 3285 and 3285-10 measure DC, AC or AC+DC current in live power lines without tapping into or connecting the lines, and includes a variety of features and functions including automatic zero adjustment that turns a normally troublesome task into a one-touch operation. Model 3285 comes with AC adapter and output terminals to enable connection to other instruments such as recorders. 200.0/ 2000 A, Basic accuracy: ±1.3 % rdg. ±3 dgt.